My friend (and trainer/Zumba instructor!) 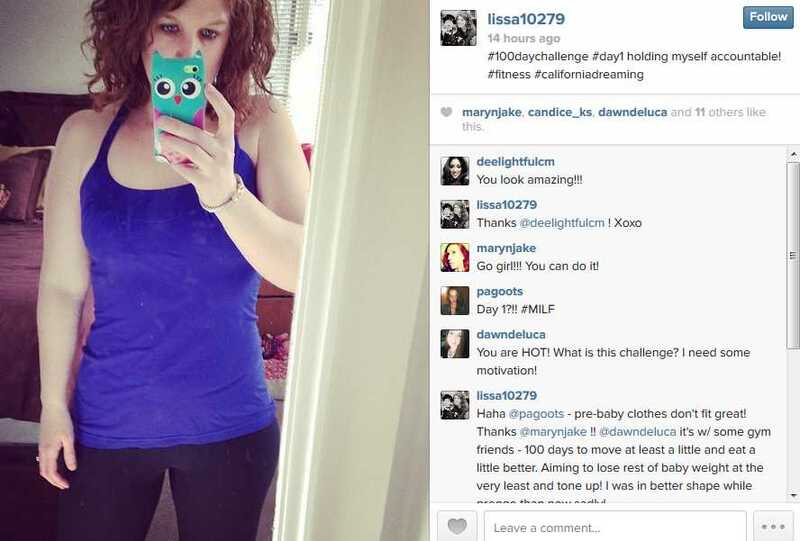 created a private Facebook group called the 100 Day Challenge: 100 Days to a Healthier Me. We’re encouraged to post recipes, workouts of the day, photos of us in workout gear, motivational phrases, etc. It’s a great idea and I’m 100% behind it. It’s essentially a three-month-commitment to health and wellness. And the timing is perfect. As you know, I’ve recently recommitted myself to moving a little more and eating a little better. Nothing earth-shattering or monumental: no over-exercising, no restricting … just awareness and and accountability. I posted this Before pic on Instagram and will likely do one at Days #20, #40, #60, #80 and #100. I figure every 20 days isn’t too obnoxious (I don’t want to inundate my followers but sometimes you need to see the changes. And when they are on yourself, it’s almost impossible to do). So this is me, six months post-partum. Taking a selfie. Which I truthfully typically think is lame/vain/silly. We were supposed to post our “before” pic to our Facebook group and since Instagram uses hashtags, too, I figured why the hell not share it out there, publicly. Because this IS me. Right now. And all things considered, I feel decent in my own skin. Not fabulous — but not terrible. And that says a lot, being a mom of two — the youngest of whom hasn’t even been out of the womb as long as he was in. So when I feel frustrated that I haven’t lost all the baby weight yet or fixate on the fact that my clothes don’t fit the same as they did or I would like … I try to remember that I’m not doing too bad. It isn’t always easy, but everyone has to start somewhere and this is my new starting point. I should note: I’m not expecting miracles and my goal of this challenge isn’t really to do much more than lose the last few baby pounds and tone up — but I love the idea of accountability and since my online WW support group disbanded (though I still adore them all and think some might even still read? !-and we keep up via Facebook!) I needed the daily check-ins. The encouragement to keep going. And it’s already working. Last night I stopped at the grocery store on my way home from the gym (at 9:45 PM, mind you) and stocked up on fresh fruit and other goodies for meals: planning = success. And today, the challenge encouraged me to walk to the post office and downtown today just for kicks — 30 extra minutes of fitness I might not have otherwise gotten. So there’s that. Above all, I just want to feel good … and having a goal (get back in shape before brother’s wedding! )– and a challenge to hold my feet to the fire — is just what I needed. And that alone feels amazing. Good for you! Hope it goes well! Thank you and best wishes to you, mama-to-be! You look amazing! Lissa, you look gorgeous in your “before” pic, so one can only imagine the “after” pic! Good for you for joining an accountability group and I will enjoy watching your progress. It’s amazing how good we feel when we step it up a notch and reach our goals!